Press the BSD switch with the Ignition switch in the ON position. The indicator on the BSD switch will illuminate. When the vehicle speed exceeds 30 km/h (20 mph), the system will be activated. Press the BSD switch again. The indicator on the switch will go off. When the system is not used, turn the system off by turning off the switch. If the vehicle is turned off then on again, the BSD system returns to the previous state. 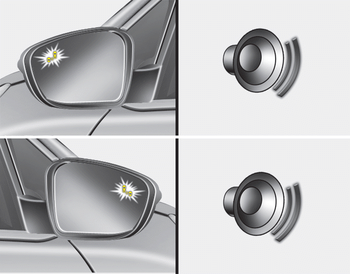 When the system is turned on, the warning light will illuminate for 3 seconds on the outside rearview mirror. 1. The system is on. 2. The vehicle speed is above about 30 km/h (20 mph). 3. An oncoming vehicle is detected in the blind spot area. If a vehicle is detected within the boundary of the system, an amber warning light will illuminate on the outside rearview mirror. 2. The turn signal is applied (same side as where the vehicle is being detected). 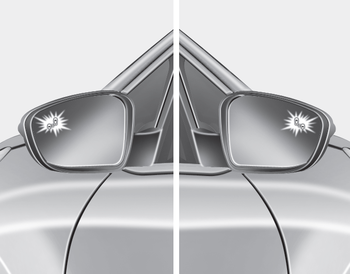 When this alert is activated, the warning light on the outside rearview mirror will also blink. If you turn off the turn signal indicator, the warning chime will be deactivated. - The second stage alarm can be deactivated. Go to the User Settings Mode → Sound and select "BSD" on the LCD display. Go to the User Settings Mode → Sound and deselect "BSD" on the LCD display.